Burma is a large but nowadays also very isolated country in the Southwest Asia and controversy starts already in its name. In the 1989 coup its official name was changed to Myanmar, a name used in some Western media, but people feel that using this name supports the military junta. Also, the name has been used for the main ethnic group Bamar instead of the country, so others feel it excludes other ethnicities. The human rights situation in Burma is terrible, it’s a police state like straight from a dystopian novel. Traditionally its culture has been mostly Buddhist, but was influenced by the British colonial rule, especially the Burmese education system. The Burmese cuisine has been influenced by those of its neighbours, especially China, India and Thailand (luckily the Brits apparently didn’t leave much of a mark! ), but it’s quite diverse owing to the various ethnic groups. Fish and seafood are some of its staples. A popular vegetable is a bean called danyin thi or jengkol, which can cause food poisoning no matter how it is prepared. Mango is the most priced fruit. 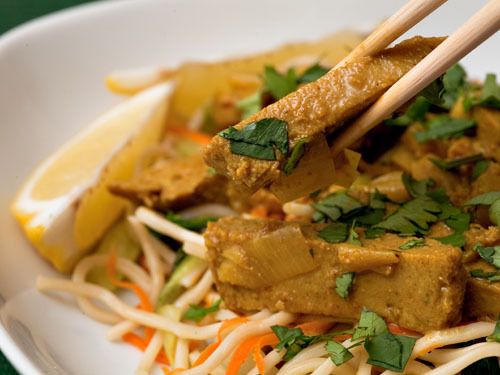 The Burmese also eat shan tohu, often called Burmese tofu, but made of chickpea flour. They not only drink tea, but also eat it, in a fermented/pickled form called lahpet, often eaten in salads. The Panthays are a group of Chinese muslims in Burma, though they have become more mixed with the rest of the population. When I originally saw a link to this recipe, from the New York Times, it was described as a Hui recipe (which I was looking for), the Hui being Chinese muslims in China. The Muslim minorities of many of the non-Muslim Asian countries have cuisines that differ from the “mainstream” cuisines of the countries and I wanted to honour that. It’s quite a tasty dish, even if not as exotic as many other Burmese dishes. For the “chicken” I used some frozen leftovers from Bryanna Clark Grogan’s seitan tofu turkey, which I make for Christmas every year. It has a nice, soft but firm texture and absorbs flavours better than seitan. But you could use any mock chicken, even Chinese chicken-style tofu. 2-4 lemon wedges, for serving. Cook the noodles until barely tender and drain. Season the mock chicken with pepper (it’s probably salted already). Sauté the onion, garlic and ginger in two tablespoons of oil until lightly browned, about two minutes. Add the “chicken”, powdered spices, “fish sauce”and two tablespoons of water. Reduce the heat, cover and simmer for five minutes. Remove from heat, but keep warm. Heat three tablespoons of oil and sauté the bok choy until wilted, 3-5 minutes. Add the carrots and noodles and sauté for 2-3 minutes more. Add some salt and pepper to taste. Divide noodles between two plates and place the “chicken” mixture on top of it. Top with a lot of chopped cilantro and garnish with lemon wedges. Makes two portions. This entry was written on April 21st, 2011 by Maija Haavisto and filed under Asia, Pasta and noodles.